There is something about walking into the pet store and looking down into a pen full of fuzzy, long-eared creatures that makes the average person want to suddenly become a pet owner. Rabbits possess a charm that entices both children and adults alike. This charm is especially strong around Easter-time, when images of fluffy bunnies abound and children beg their parents to please let them have a bunny. Unfortunately, too often the charm wears off after a few months and the child gets tired of caring for the rabbit. This leaves the parents with another responsibility they do not want, so the poor rabbit is dumped somewhere, or returned to the place of purchase, or (I hope) adopted by someone else. 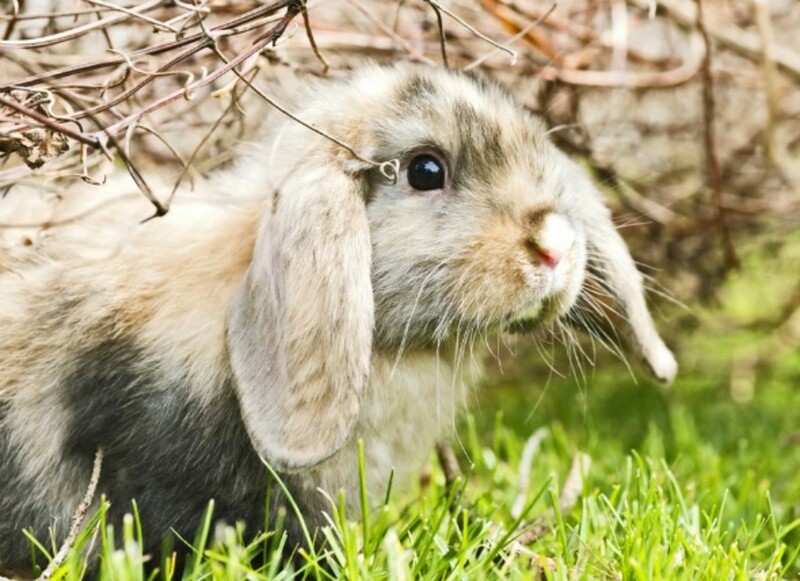 Understanding a few things about rabbits and their care might cause some potential owners to reconsider their decision. On the other hand, others may to desire to not only buy but actually keep the rabbit if they knew more about them from the outset. If you are thinking about adding a rabbit to your household, or perhaps you just have, please read on to learn more about how to care for these special little creatures. It is not my intention to enter into an extensive discussion concerning the different breeds of rabbits or scientific facts here. 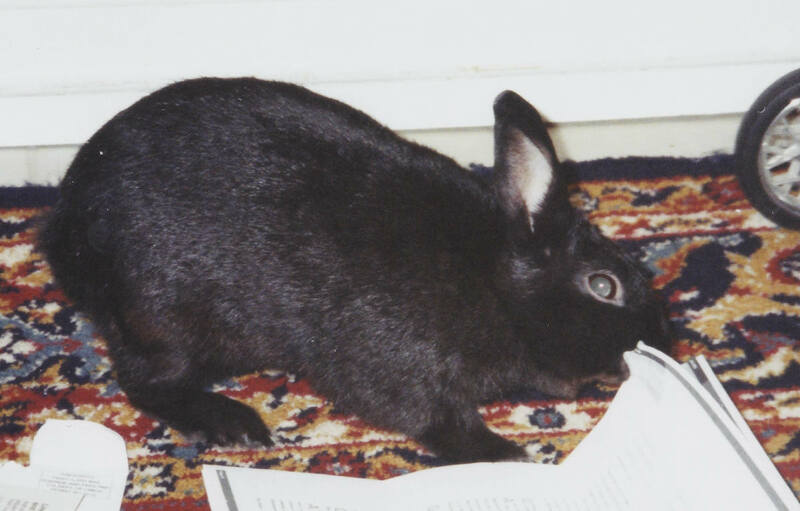 There are many good publications available at the library or online if you wish to do extensive research on breeds before purchasing a rabbit. I would like to mention a few things about owning rabbits, mainly the types found at a pet or feed store, that may affect a person's decision to buy one. The first thing is the lifespan of a rabbit. 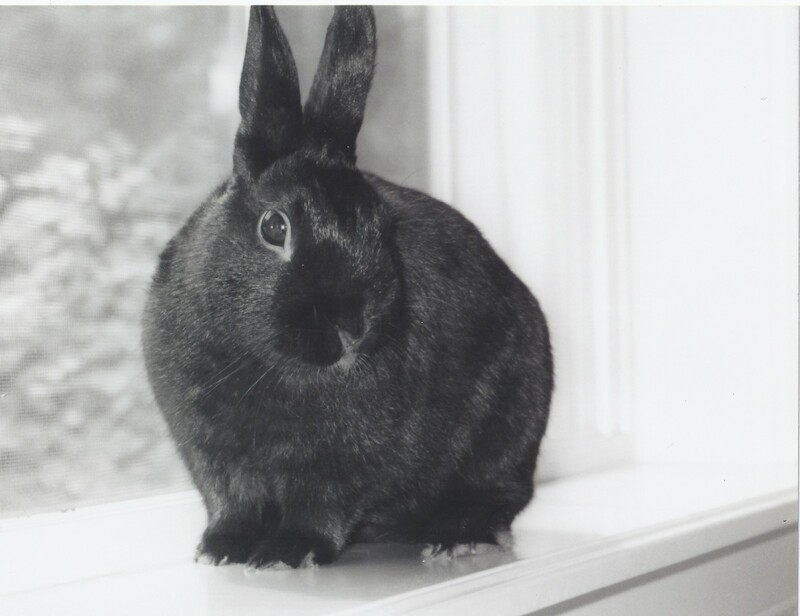 A well-cared-for rabbit can easily live seven or eight years, so when you purchase a rabbit, you must think long-term. Will your eight-year-old, who begs so passionately for a bunny now, want to still be taking care of it when he is fifteen? If the answer is "no", then will you want to look after it? Another thing to consider is where you will keep the rabbit. Most areas of the U.S. experience temperature ranges that are too extreme for most people to be able to keep a rabbit outside all year round. Do you have a place in your home to put its cage, either permanently or when the weather is too hot or too cold? Also, the initial costs are more than just the fifteen to twenty-five dollars you will pay for the animal itself. The bare essentials you will need to purchase for the new rabbit will total at least $85 to $100, if not more. In addition to this, the proper upkeep of the rabbit will require regular purchases of food, bedding, etc., along with potential extras like vet visits. Are you able to make the financial commitment, both now and in the future? If you have decided that a rabbit is the right pet for you, then your next decision is where you will get one. It is worth checking to see if there is some sort of rabbit rescue in your area that has bunnies that need a home. If not, then pet stores and private breeders are the best places to look for one. If you are not picky about the specific breed you buy, a pet store can be the more convenient route than the breeder since you can also purchase all of the needed items for the rabbit's care during the same visit. Once you have found a place to acquire this new pet, there are a few rules that should be followed when selecting a rabbit. First, look at the area where the rabbits are kept. Is it reasonably clean? If not, then you may want to go somewhere else. Too-dirty pens can mean you may end up with an unhealthy bunny. Second, examine the animals in the pen. Do any of them have runny eyes or noses? Is there evidence, in the cage or on the animals themselves, that one or more of them have loose or runny bowels (bunny poo should look like hard little balls, not wet and stinky!)? Once again, move on if any of the above is evident, even if only one rabbit appears to be ill. It is possible the others are sick as well but just not showing symptoms yet. You do not want your first bunny to be a sick bunny! If the animals are all well, then start to determine their personalities. Yes, like dogs or cats, they do have personalities. Be aware, however, that sometimes a rabbit that is shy in the pet store may end up bossing around the entire household! A good sort of rabbit will not run away in terror when you slowly puts your hand into the cage to pet it. If it runs up to be pet, that is even better. If the pet store permits you to do so, pick up the rabbits gently. Put one hand under the rabbit's tummy near its front paws, and with the other hand support its bottom. Draw the rabbit to your chest and move the hand that was under its stomach to its back. If the rabbit makes it through this process without freaking out, then you may consider it a potential winner. (The exception to this is if the person purchasing the rabbit is an adult or teenager that has the time to work with a nervous rabbit and teach it to trust. 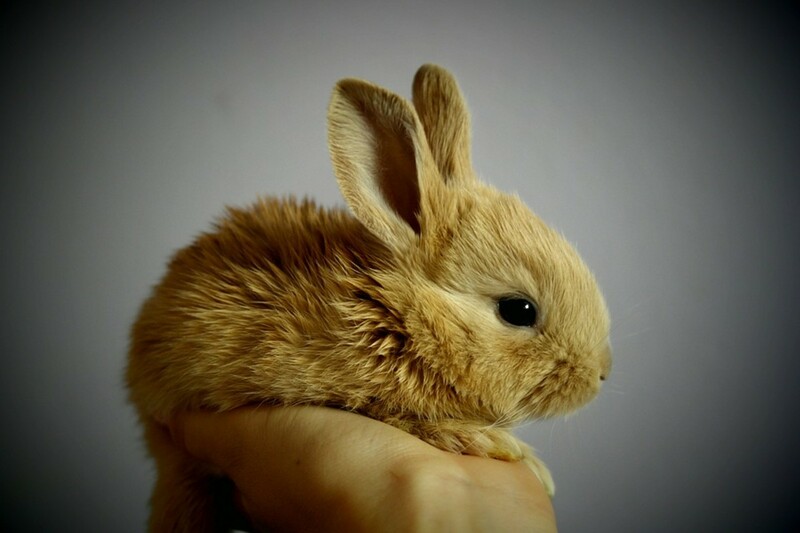 Otherwise, a more relaxed, friendly bunny is the better choice for a family with younger children.) To put the rabbit back down, lean over the pen and reverse the process, not letting go until the rabbit's feet are firmly planted on the pen's floor. You may find, in the end, two or three rabbits that would make good pets. At this point it normally will come down to which bunny you think is cuter than the rest! I would advise to resist the temptation to get more than one, however, for a few reasons: first, one rabbit will be more than enough work for a first-timer, second, sometimes rabbits end up not getting along with each other once they reach adulthood, and, third, you want the rabbit to bond with its humans, not another rabbit. After selecting a pet, the next thing you will need to do is find all of the items needed to house and feed the rabbit (unless you are going to a breeder to buy a rabbit—in that case, the items listed below should be purchased first). Normally a pet store associate can assist you with this step. The most expensive item you will need is the cage. I do not recommend trying to "save" money by buying a small or sub-par cage. Forgo things that are not necessary at first, like treats and toys. While the rabbit may enjoy those items, it will not need them and you can always purchase such things later. The cage is the place where the rabbit will spend the bulk of its time. An unhappy bunny is normally found in an inadequate cage. Average pet store rabbits are breeds that will not exceed six or seven pounds, with most only growing to about four or five pounds. This means the rabbit will not need an enormous cage. 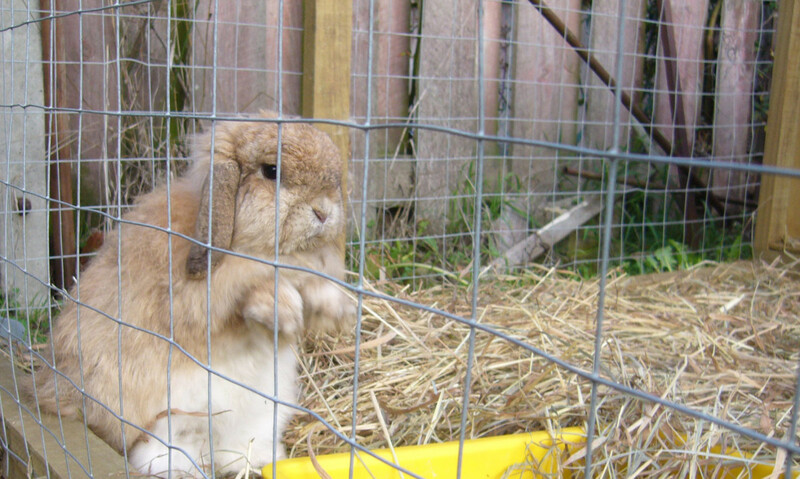 Cages that are roughly 20-24 inches wide by 36 inches long are sufficient for small to medium rabbits. You may want to buy something slightly larger than this for a breed that can grow to seven pounds, though. Based on my personal experience, I believe the best type of rabbit cage is one with a plastic bottom and a top made out of coated metal bars. I do not suggest getting the wooden "bunny hutch" type as the wire mesh on the bottom can be very hard on their little feet. I would also recommend getting a litter box to place in the cage. There are corner-fitting types made specifically for rabbits; however, a regular cat pan that fits in one end of the cage works just fine as well. The litter box cuts down on the amount of bedding you must put in the cage, because only the litter box bedding will need to be changed frequently if you train your bunny to do his business there. An easy way to encourage your bunny to use the box is to dump any bedding he soils outside of the box into the litter pan during the first few days you have him. Rabbits are smart, and if you do this most rabbits will make the connection within the first week or so that the box is the place to go potty. 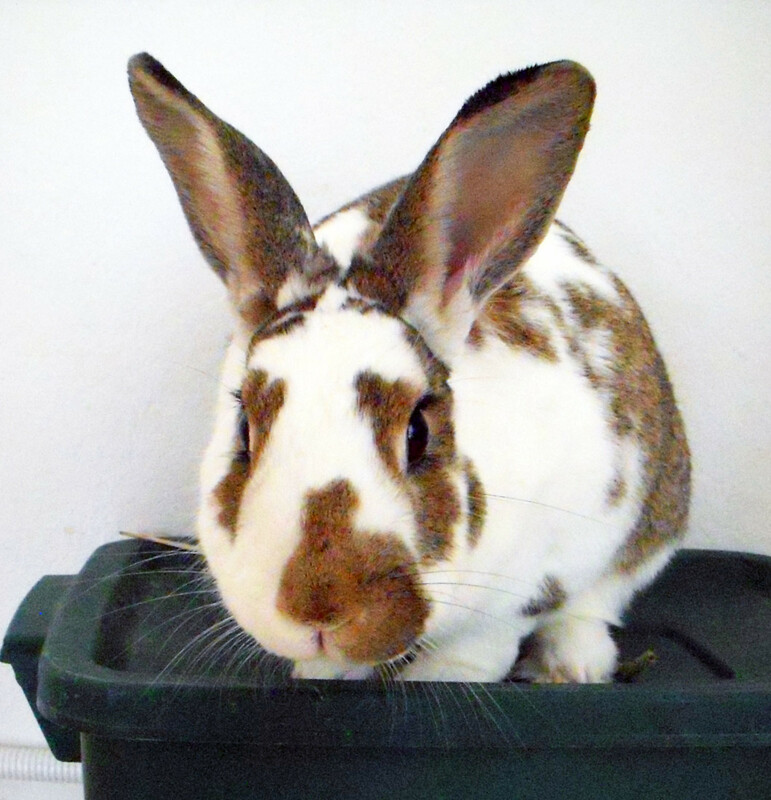 Make sure you use Velcro® to attach the litter box to the bottom of the cage so that the rabbit cannot move the box or tip it over and create a mess. As for the type of bedding to use in the cage, try pine or aspen shavings. Pine is cheaper than aspen, but it is possible that the rabbit could have problems with the pine dust. This was the case with my sister's rabbit. His eyes would become very red around the rims every time she used pine bedding. After realizing the connection between the redness and the bedding, she switched to aspen bedding, and he never had this problem again. There are also pellet-style litters made of pine or recycled newspaper, or shredded bedding made of recycled materials. These tend to be more pricey, but work just as well as pine or aspen. I would suggest avoiding cedar shavings; the oils in the cedar tend to be irritating to small animals. You must never use kitty litter, in the cage or in the litter box. Rabbits tend to chew on their bedding and dig around their cage constantly. Ingesting clay, crystal, or clumping cat litter or inhaling large amounts of the dust from it would cause a rabbit to become ill.
For water, you will need a good plastic water bottle that attaches to the exterior of the cage. Attaching the bottle to the exterior will keep the rabbit from chewing on it or knocking it down. For food, you should get a small ceramic bowl. I would avoid using a plastic bowl as it tends to not be heavy enough to keep the rabbit from knocking it over or tossing it around the cage (rabbits will do this). You can also get a hay rack that attaches to the outside of the cage in which you may put hay for the rabbit. A rabbit's diet should mainly consist of a good-quality pellet food and timothy hay. You can supplement the rabbit's diet with fresh vegetables like carrots and lettuce, and also give it treats now and then. It is better to give rabbits treats that are made especially for them and avoid the temptation to give them snacks made for people. Wood chew-sticks made for rabbits, while not technically food, are an important thing to give your rabbit as well. Rabbit's teeth grow continually, so they need something to help them keep their teeth worn down to the proper length. Make sure to use something made specifically for small animals and not random pieces of wood, however, as random wood possibly could have been chemically treated. Toys are something that can add some fun into a rabbit's existence, so if you can purchase a couple of playthings at first, do so. If not, it is all right to wait, as a bunny will prefer human attention over a toy most of the time anyway. There are toys that have been created for rabbits in particular, but there are some cat toys you can use as rabbit toys, too. Just make sure that whatever toy you choose is durable since a bunny's favorite game is picking up things with its teeth and giving it a toss. They seem to enjoy toys that jingle or rattle. 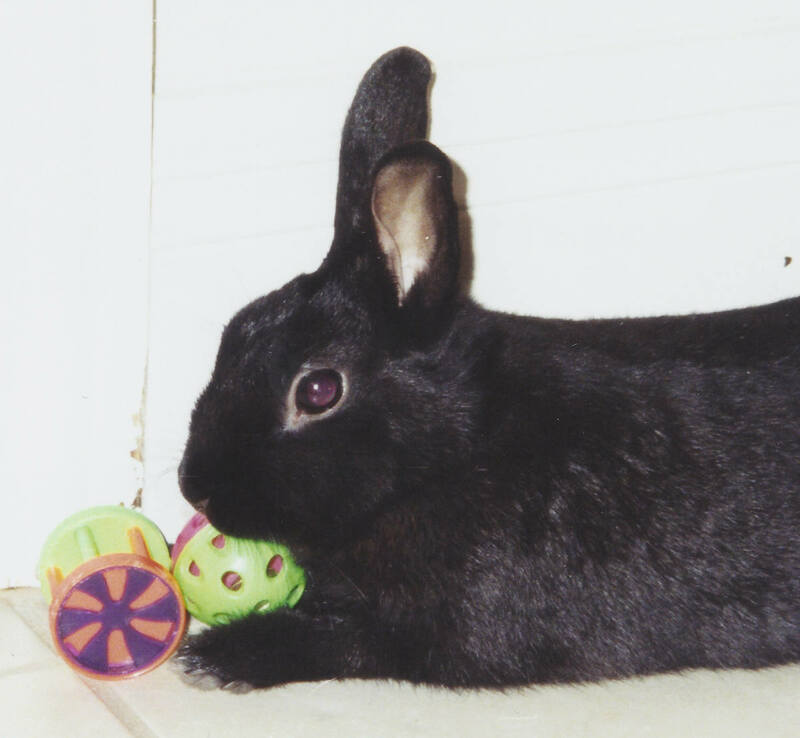 I know my sister's bunny loved his plastic "wagon wheel" cat toy because it jingled and he could pick it up and give a fling! Another favorite of his was a carrot-shaped rattle-and-toss toy, which provided him hours of entertainment. Once the rabbit and all of the items you need to make it comfortable have been purchased, the next challenge will be making the rabbit feel at home in its new environment. The first few days after coming home are important for the rabbit, both in its acclimating to a new place as well as its bonding with its new owner(s). After bringing the rabbit home, leave it in the cardboard carrier from the pet store while setting up its cage. Place the cage in a quiet, draft-free corner of a room that will be away from any other pets that may be in the house. Put in a moderate amount of bedding (place the litter box in the cage first if using one), fill the bowl, hay rack, and water bottle, and put a chew stick in the cage. Once everything is ready, put the rabbit in its cage, pet it gently, and then leave it alone. I know the greatest temptation, especially for children, is to hold, pet, and play with the new bunny from the moment it comes into the house. This is great fun for the family, but not for the poor little rabbit. It will be quite frightened by all of the sudden changes in its environment. This causes stress in the rabbit, and if you add lots of noise and handling into the mix, it can make the rabbit even more stressed, which can cause it to become ill. The biggest favor you can do for your new pet is give it time to adjust. This means gentle petting (with the rabbit still in the cage) and quiet for at least the first twenty-four hours. After that, if it still seems nervous, give it another day or two before taking it out to play with it or hold it. Otherwise, if it appears to be happy and responsive after the first day, then it is probably ready for some limited playtime. If a you are going to allow the rabbit out to run in the house or yard (and I highly recommend that this be done) then a few things must be done before letting the rabbit loose. First, it is better to choose a single area within the house rather than allow the rabbit to wander freely. Rabbits can be prone to mischief! An area that has no carpeting, such as the kitchen, is best as bunny may decide that the carpet looks like something good to munch upon while playing. Next, get down on the rabbit's level and look around the room. Are there electrical cords, speaker wires, or other sorts of cables within the bunny's reach? If so, move them out of the way or find a way to cover them up so the rabbit cannot chew on them. Are there other things at "bunny level" that could be harmful if the rabbit chewed on them? Move these things, either permanently or temporarily while the rabbit is out of its cage. There will inevitably be things they may try to nibble on, like furniture or woodwork, that cannot be removed from the room. Supervising the rabbit while it is out running is the best way to keep it from chewing on such items. Some rabbits seem to do well with not chewing on everything in their path once they have been taught not to do so. My sister's rabbit was actually very good about not chewing on the furniture (though a couple of door frames were not so fortunate! ), but he still needed to be watched just in case. Others may need to be reminded consistently not to chew on things. A small squirt from a water bottle can be used to help reinforce a firm "no" whenever chewing occurs (avoid getting the water in bunny's ears, however). If the problem persists, you may need to purchase a bitter-tasting spray from the local pet store and spray it on whatever the rabbit insists on gnawing upon (always read the directions thoroughly before spraying this on furniture, as it can damage some materials). Outdoors, "bunny-proofing" the play space also applies. Supervision is also important due to the presence of potential predators. If one's yard is not fenced-in, a puppy pen works well. Make sure not to put the rabbit out in the grass right after your lawn has been treated for weeds or pests. Ingesting chemicals can equal one sick bunny! Whether a rabbit is allowed to interact with other pets in a household is a question that must be weighed carefully. Cats are natural hunters and may try to pounce on a rabbit. Many types of dogs were bred to hunt animals like rabbits. Some cats or dogs, particularly those who are still young themselves, may learn to accept the rabbit as a friend rather than prey, however. Rabbits are not compatible with most other small animals (ferrets are a definite "no"), though rabbits and guinea pigs may learn to tolerate one another. Birds are better off as friends from a distance. My advice is to not assume that your other pets will not harm the rabbit, or vice versa, even if they are quite gentle normally. How an animal behaves towards other animals as opposed to people can be quite different. Exercise caution, and if there is any doubt, keep the rabbit and the other pet(s) apart. Always monitor the rabbit's health carefully. 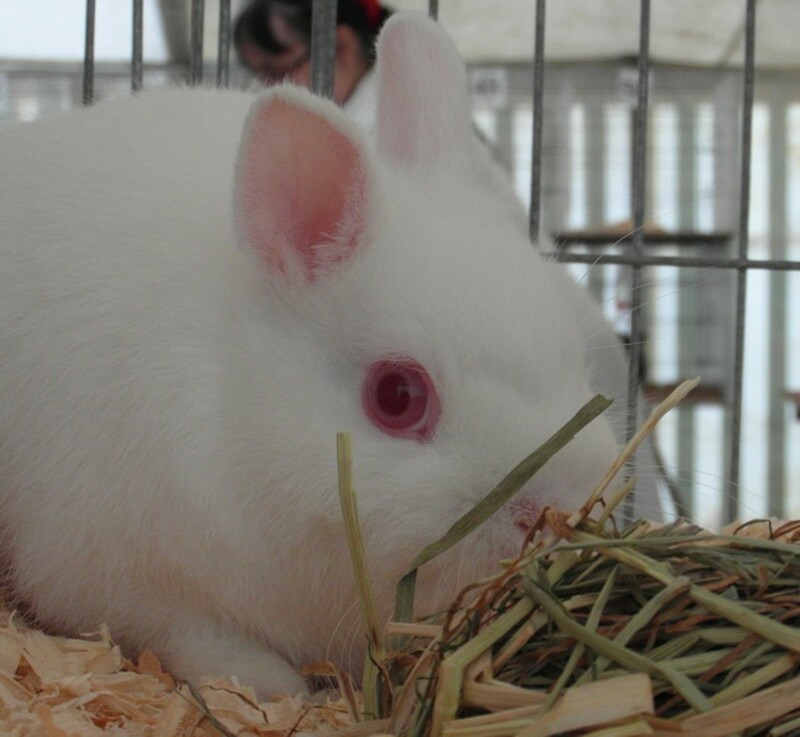 Illness in a rabbit can quickly become fatal if left unchecked. Signs of diarrhea and dehydration call for immediate action. If the rabbit ever appears to be ill, call the vet's office. They will know whether the rabbit needs to be brought in or not. Try to find a vet in your area that specializes in small animal care as they will be more familiar with the illnesses and physical problems to which rabbits can be prone. A clean cage, proper feeding, and supervision while the rabbit is out of its cage are the greatest aids in keeping the rabbit healthy. Play with your rabbit, talk to it, and let it know you love it. Rabbits love attention and can be quite affectionate. They make excellent pets for people of most ages in most situations. If proper consideration is given to the purchase and care of a rabbit, the result will be the gain of a furry friend the whole family can enjoy. American Rabbit Breeders Association, Inc. website offering brief descriptions of different rabbit breeds. What made you want to have a pet rabbit? I wanted a pet that was small, but playful. I wanted to experience owning a more unusual sort of pet. I thought it would make an interesting pet for my children. I think rabbits are just cute in general, and thought it might be fun to have one. I think I stressed out my bunny on its first day home. If I follow what you said in the article from now on, will it be okay? Yes, the rabbit should be all right. It may be skittish a little bit longer than usual, but if you help your rabbit adapt to its new home slowly and gently from here on out, it will eventually overcome its fear. 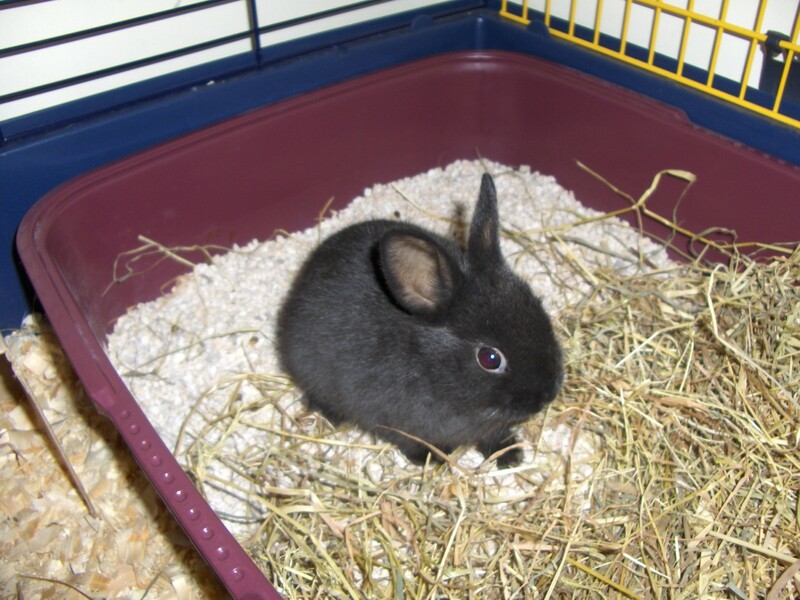 Do you think a rabbit would be too scared to go in a rabbit run or be around people on its first day in a new home? Yes, a rabbit typically needs at least a day or two to adjust to its new home before it is ready to interact with people or run around. Each rabbit responds to its new environment differently, however, so after the initial 24 hours, proceed with interaction and running time according to how relaxed your rabbit seems to be in its new home. I want to clean my new rabbit's cage, but he is still scared of me. How do I pick him up without scaring him? If there is a side door on the cage, you could try putting him in a box temporarily. Open the door and place a box in front of the opening, then gently shoo the rabbit into the box. Just reverse the process after you are done with the cleaning. If the cage only opens from the top, you can just try to clean it with the rabbit still in it. You may not be able to be as thorough as you would like to be, but it would better than a dirty cage. A small dustpan works well to scoop out old litter. A wipe-down with a damp paper towel gets the worst of the pee residue up before you add new litter. The rabbit may be a bit upset by the activity, but if you move slowly and speak in soothing tones while you clean, he will be all right. Can a rabbit roam freely from the time you first get it? No, I would not let your rabbit roam freely the first week you have it. It needs time to adjust to its new environment, and a cage is a safe space in which it can do that without becoming too stressed. Also, if the rabbit hasn't learned to use a litter box yet, you may want to train it to do that first before letting it loose in the house (obviously this won't matter, however, if you plan to let it roam in a pen in the yard). I got a new bunny recently. I left her alone in the cage for a few hours, and then started to socialize with her as she became more comfortable and playful. After this, she stopped eating and started to have diarrhea, even though she was completely fine before I got her. I had to give her back to the breeder, who said that has never happened before. What can I do to prevent this from happening again? If the rabbit comes to you with an undetected gastrointestinal infection, there really isn't anything you can do to prevent what you have described from occurring; it can only be treated by a vet. If such an incident is stress-induced, however, then you can take steps to avoid having it happen again. The first would be to leave the rabbit in the cage for 24 hours, and only pet it gently a few times during this period. After that, you can take the rabbit out for one or two 15-minute holding and playing sessions if it seems ready; if it isn't ready, give it another day or two in the cage. Give it at least a week to really settle in before you engage in any extended playtime. I know it is tempting to hold and play with it a lot those first several days, but a rabbit always does better when it is able to adjust to its new home slowly. Can a rabbit escape from an outside enclosure? Yes, a rabbit can escape from an outside enclosure if it is not properly watched. Most rabbits are burrowing creatures by nature, and could easily dig under the fencing holding them in. Always watch your bunny if you allow it time outside! Do you need to get a travel case for the rabbit when you take the rabbit home? No, a medium-sized cardboard box with several air holes punched in the sides (close to the top) will usually suffice. Make sure to also put some bedding in the bottom of the box to absorb any bunny messes made while in transit! I recently got a cute white rabbit. I have noticed her feet get really dirty, so much so that they are almost impossible for her to clean herself. I can't pick her up yet, as she doesn't trust me enough to be comfortable with that. How do I solve this dirty feet issue, since I have read that you can't bathe a rabbit as you would a dog? The feet of all rabbits are rather dirty most of the time; you are only noticing it more since your rabbit is white. Once you can pick her up, you can simply use a damp rag or cat wipes (available at most pet stores or online) to wipe her feet off now and then. Bathing is the only way to remove somewhat the yellowish stains that form on rabbits with white feet. It is possible to bathe a rabbit, as long as you have rabbit shampoo and avoid getting water in its eyes, nose, and ears. You should not bathe it very often, however, especially if you live in a cool climate, as you do not want to risk giving the rabbit a chill. Do rabbits need to be vaccinated? If you plan to keep your rabbit inside at all times, then no, it is not necessary for you to vaccinate your rabbit. If you plan to let it run outside or house it in an outdoor pen, then I would consider having it vaccinated. Find a veterinarian that specializes in rabbit care, since that type of vet will know exactly what vaccinations your rabbit would need. My bunny is always stressed out. How do I relieve its stress? One of the main causes of stress for rabbits is an environment that is unpleasant for them. Too much noise, too much heat or cold, too much activity, or the presence of other animals that make it nervous (such as dogs) are all factors that can make an environment stressful to a rabbit. To alleviate your rabbit's stress, I would start by examining the area where its cage sits to see if one or more of these factors are impacting your rabbit's environment. If you find this to be so, then it may be time to move the cage to a new spot. 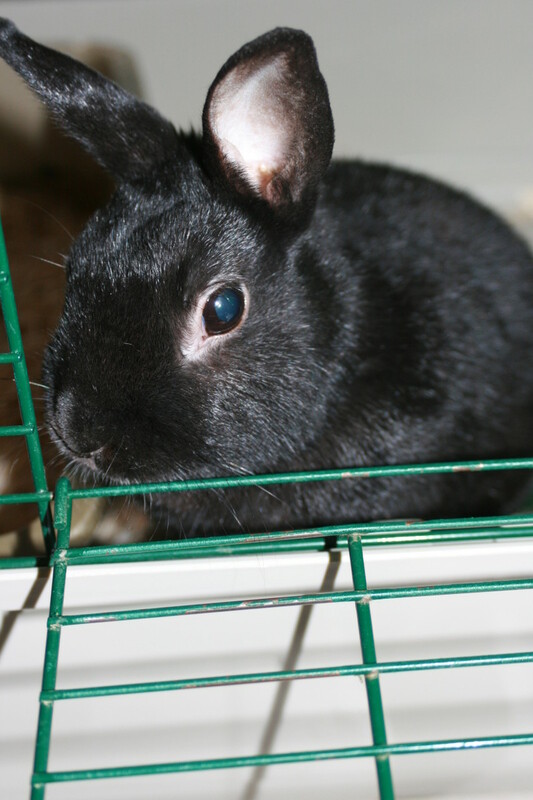 Are pet store rabbits already spayed or neutered? 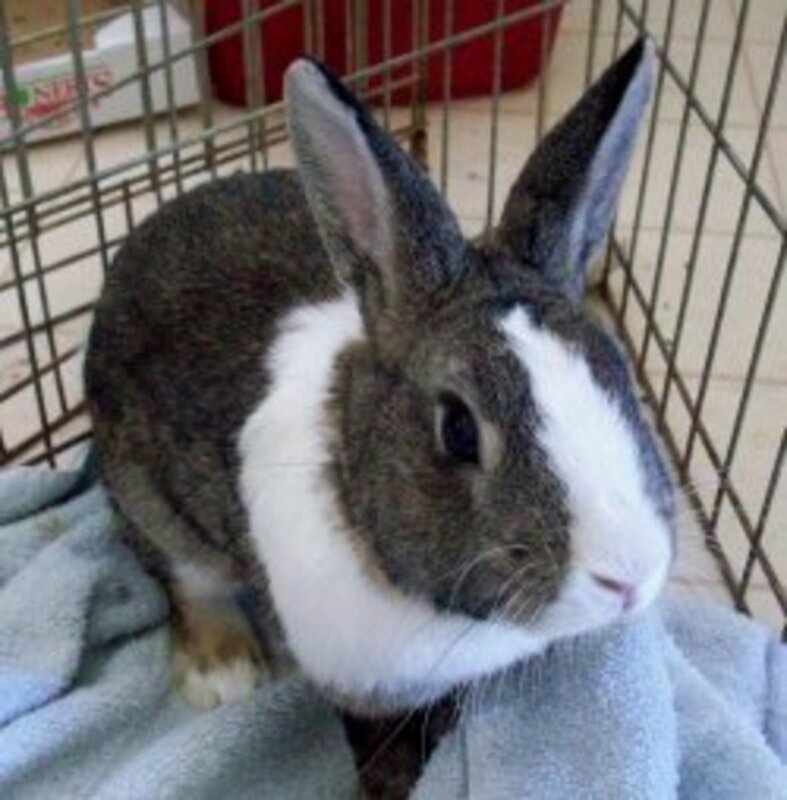 Pet store rabbits are not usually spayed or neutered. Do I need to quarantine a new rabbit if it’s my only one? No, it is not necessary to quarantine a new rabbit if you do not have any other rabbits already. Can I use fleece and towels as bedding for rabbits? I use them for my guinea pigs and want to know if I could use them for a bunny, too. I would not use fleece or towels as bedding for a rabbit. Rabbits tend to always be nibbling on their bedding material, so whatever you use has to be safe for your rabbit to ingest. Fabric fibers are not something you would want your rabbit to be consuming. I would suggest using something such as aspen shavings or paper fiber bedding instead. Is a Rabbit the Best Pet for You? @ kina: I'm so glad you are rescuing this poor bunny! No, rabbits do not normally require any shots; yes, do take it to get its leg treated and get it some proper rabbit food. The rabbit can be washed. You can find rabbit shampoo at most pet stores, though cat shampoo will work if the store has no rabbit shampoo. Just make sure to keep the soap and water out of the rabbits eyes, nose, and ears. Use lukewarm water, and dry it thoroughly before putting it in its cage again (a damp bunny can become chilled if it sits in a draft). If you can have someone help you bathe it, that would be the best way to do it. Rabbits are not usually very fond of baths if they've never had one while young; your rabbit may try to bolt if there is not a second pair of hands to keep it in the bath. @ Kiara: Yes, anything I have said here would be applicable to a rabbit kept outdoors. I would add that you would need to pick a spot for the pen that is out of the elements. A place that is shady from mid-morning onward would also be ideal, as you do not want the rabbit to overheat. Very helpful. If I were to get an outdoor rabbit would the same rules apply? @ Sierra T: Everything I said in the article would apply regardless of the animal's age (though litter box training might be more difficult if this rabbit hasn't already been trained). I would say that the rabbit may be a bit confused at first and miss its original owner. Don't be surprised if it doesn't take to you right away, as it will need to adjust to its sudden change of environment. Just be gentle and patient with the rabbit as it processes being in new surroundings, and before long it will see you as its best friend. hi! I am about to get a rabbit that is around 2 years old within the next month or two. Is there something that I should be extra careful with or something I should know since she wont be as young as when someone normally gets a new rabbit? @ Mackenzie Bates: Congratulations on getting your new friend! I am glad I could help you out in making sure you have what you need to keep your rabbit happy and healthy. @ Freyjia: I would watch them carefully when they first interact, and hold them while introducing them to one another. Rabbits are langamorphs, and rats are rodents, so it is not a given they will get along, since they are different species. I honestly would be more concerned about the rat showing aggression, since rats are omnivores. They may end up liking each other, but it is best to monitor their interactions heavily until you are absolutely certain they won't bite/scratch each other. Even after that you would need to watch them if they are out together. As for the hay: it is better to give a rabbit timothy hay if you can get it. Hi! My fiance and i are getting a 5 month old bunny soon. This will be our 1st bunny. What im curious about is: we also have a baby rat too. What precautions should we take to introduce them to each other, they are both boys and both babies. I do have separate cages for them. Also for a 5 month old bunny can we feed him timithy hay or does it have to be alpha hay?